Whether your party is venturing into a maze of twisty passages or escaping from the creature that dragged them to the centre of its distressingly bone-strewn lair, no Game Master wants to spend time drawing every narrow cave tunnel and dead end. Fortunately, with Paizo's latest Pathfinder Flip-Mat, you don't have to! This line of gaming maps provides ready-to-use fantasy set pieces for the busy Game Master. Full of beautiful details, including a fungus-infested cave and a spiraling descent, this double-sided map makes the perfect setting for encounters in the dank and dark! Don't waste your time sketching when you could be playing. 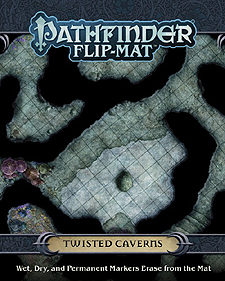 With Pathfinder Flip-Mat: Twisted Caverns, you'll be prepared next time your players head underground!